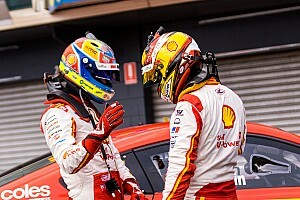 David Reynolds says he would have 'lunged' title winner Scott McLaughlin late in Sunday's Supercars finale if the Penske driver had tried to make a fight of it. Freshly-crowned Supercars champion Scott McLaughlin says his breakthrough title win delivers on a promise he made to his late grandmother. Craig Lowndes says he feels 'numb' after bringing his career as a full-time Supercars driver to a close in Newcastle this evening. Scott McLaughlin says he felt more pressure heading into today's Supercars title decider after Shane van Gisbergen was slapped with his post-race penalty from Saturday. Shane van Gisbergen says his post-race penalty this morning deflated what could have been the "most epic finish in history". Scott McLaughlin sacrificed a potential win in Newcastle to David Reynolds, the Penske driver settling for a second place that makes him Supercars champion. David Reynolds jumped title contenders Scott McLaughlin and Shane van Gisbergen in the Top 10 Shootout to grab pole for this afternoon's Supercars finale in the streets of Newcastle. Shane van Gisbergen has labelled his post-race penalty 's**t' and claimed that Supercars has 'taken away' his hopes of winning a second championship. Scott McLaughlin will run last in today's Top 10 Shootout in Newcastle after coming out on a tense battle of the title contenders in regular qualifying. The Deputy Race Director has recommended that winner Shane van Gisbergen be penalised for a pitstop infringement during today's Supercars, however a final decision won't be made until tomorrow. Shane van Gisbergen's stunning win in Newcastle could be under threat, as Supercars officials investigate an alleged pitstop infringement. Shane van Gisbergen will go into the final day of the Supercars season just two points behind Scott McLaughlin, after trumping the Penske driver with a last-lap pass on the streets of Newcastle this evening. Shane van Gisbergen will start the first leg of this weekend's Supercars title decider from pole position, while teammate Jamie Whincup kept Scott McLaughlin off the front row. Scott McLaughlin says he'll go into tomorrow pretending it's a clean sheet in terms of the title fight, as he looks to avoid a repeat of last year's devastating loss. 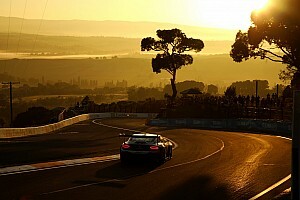 Scott McLaughlin ended Friday's Supercars running in Newcastle as the man to beat, topping the second and final practice session by less than a tenth. Lee Holdsworth topped the opening practice session on the streets of Newcastle, as Shane van Gisbergen ended up well clear of Supercars title rival Scott McLaughlin. Craig Lowndes will run a special livery for his final Supercars round as a full-timer this weekend, with a gold look aged on the iconic Betta Electrical colours of his early Triple Eight days. Triple Eight team manager Mark Dutton says he hopes this weekend's Supercars finale in Newcastle is a "massive pain in the arse" for retiring superstar Craig Lowndes. Scott McLaughlin says he's prepared to 'get some elbows out' during this weekend's Supercars title decider in Newcastle if needed.